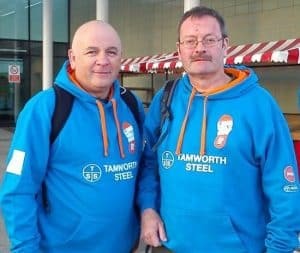 The leader and organiser of The Long Walk Home, Mark Tonks has described the efforts of the walkers, including our own Managing Director, Martin Ward and Financial Adviser, David Jones as “Absolutely heroic”. The 40 miles in one day walk for charity took place on Sunday 6th May and whilst this is difficult enough, this year the blistering heat of record temperatures for the early May Bank Holiday, soon made the walk into a mission for survival! Martin and David walked for 11 hours non-stop, achieving the distance of 40 miles. About a mile from the end Martin’s hands had swelled to three times their normal size, and David, who is a member of the Army Reserve, was helping to treat people for blisters and painful feet. The Long Walk Home is raising money for the Buddy Bag Foundation and Footsteps Counselling and Support. Buddy Bag Foundation is also Four Oaks Financial Services chosen charity. 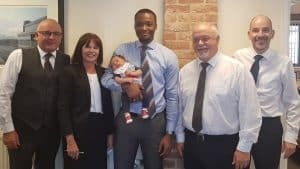 Financial Adviser, Yomi Bashorun has recently become a father for the first time. His son Oluwatobi, Tobi for short, is almost a month old, he had a water birth and weighed in at a healthy 7.7lbs. Yomi’s wife is fine and there were no complications. One month on Yomi said he was warned about the amount of work and lack of sleep that comes with the birth of a baby, he thought he was prepared, but it has still been a bit of a shock! After being present at the birth he also now has a new found respect for women and what they go through! Already Yomi can’t imagine life without Tobi and is sure he will be an avid Manchester United fan, just like his dad. We are delighted to announce that with immediate effect Charlotte Trueman has been promoted to the position of Head of Client Support. 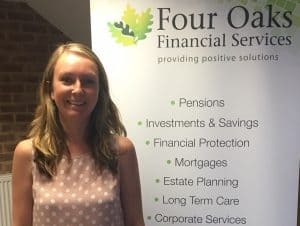 Charlotte joined Four Oaks Financial Services in July 2017 and has been an extremely valuable member of our Client Support team. Charlotte has a law degree and was previously the manager at an insurance company for 13 years. She is studying for her professional finance qualifications in our in-house training academy, with her next examination being on Taxation. It is Charlotte’s intention to become a fully qualified Financial Adviser at some point in the future, and she sees this opportunity to learn all about the administrative and client support-side of financial planning as a tremendous opportunity. As Head of Client Support, Charlotte has also become a member of our senior management team, and she is also looking forward to learning more about the business aspects of running a successful growing practice that supports our Financial Advisers in Lichfield and the wider area. Data recently published by the Council of Mortgage Lenders (now part of UK Finance) says that remortgaging was at record levels during 2017 and in October alone 41,000 borrowers found a new mortgage deal. This trend is set to continue into 2018. So what does this mean? It could indicate that more people are not moving house. 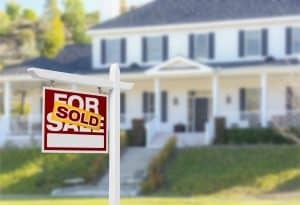 But these figures could also indicate that people are more aware that a mortgage doesn’t have to stay the same from the time you take it out, to the time you move or pay off the mortgage. Having a mortgage review every 2 years gives mortgage borrowers peace of mind that they are not paying too much for their mortgage. On the other hand, a review could show that money could be saved by remortgaging. 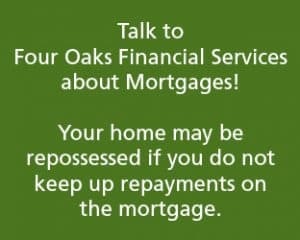 At Four Oaks Financial Services, our initial consultation is at our cost and we can quickly establish whether it is worth you considering switching your mortgage. Contact your qualified Adviser or our Client Liaison Team to make an appointment.